We enjoyed having our February Rotary Seniors of the month as our guests Tuesday at our weekly meeting. 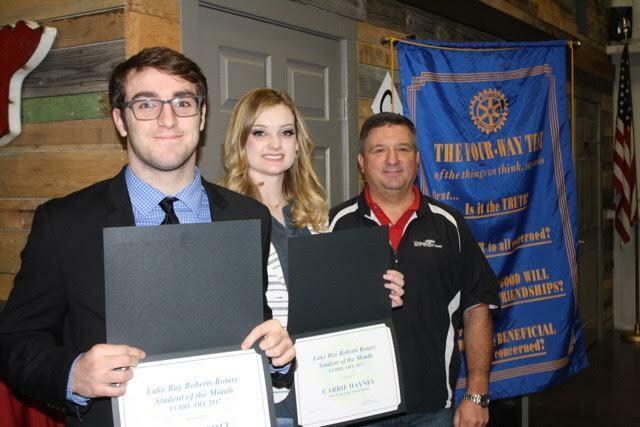 Each year, in May, the Lake Ray Roberts Rotary club will select two Pilot Point High School Seniors to receive a $1,500 scholarship. Each month two seniors are selected from Pilot Point High School as the Seniors of the month. Each senior shared a bit about who they were, what their school activities are and their plans for the future. It is always a delight for our club to hear from these outstanding seniors each month. Congratulations to Tyler Scott and Carrie Haynes!